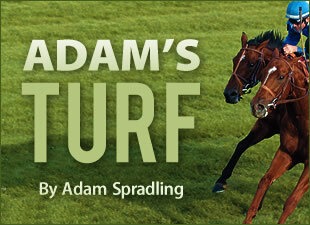 If you read Adam's Turf regularly, then maybe you won money with Ice Box. Now don't be confused with my blog post from last week, the point of that blog was to find out if you all believed in hunch bets or not and used the Florida Derby as an example. I should have offered some handicapping advice and mentioned Ice Box in last weeks post, but alas I failed at that. With several good runs on dirt, I think Ice Box will be a top contender. He does need to be trained to the distance and competition a bit more, and you may argue he has only won three of seven starts. That is okay in my book, he is growing as an athlete and may peak at the Kentucky Derby. I will pick him to finish in the top 4, for now. I still hold Eskendereya and Lookin At Lucky, even if they are the hot horses now. Here is what Jack Shinar had to say about the race. Lastly, the "Dude's" finished together right behind Lentenor. On a side note of Lentenor, for his FIRST start on DIRT and his FIRST STAKES race, coming off an allowance at Gulfstream, I think Lentenor is going to turn some heads. Read more on Lentenor here. And because I can, Go CATS! Final Four or Bust.